Motorcyclists take a break from the road. A motorcycle (or motorbike) is a single-track, two-wheeled motor vehicle powered by an engine. It is among the least expensive and most widespread forms of motorized transport in many parts of the world. Styles of motorcycles vary, depending on the task for which they are designed, such as long distance travel, navigating congested urban traffic, cruising, sport and racing, or off-road conditions. Motorcycles have exhibited many social aspects that go beyond their obvious practical uses. They have been a source of unity in the formation of motorcycle clubs and organizations based on either location or motorcycle type. Due to their mobility and economic benefits, governments of some nations have encouraged their use, such as by allowing them access to car pool lanes or having dedicated lanes for motorcycles alone. In this manner, they have become integrated into some cultures. The inspiration for the earliest dirt bike, and arguably the first motorcycle, was designed and built by the German inventors Gottlieb Daimler and Wilhelm Maybach in Bad Cannstatt (since 1905, a city district of Stuttgart) in 1885. 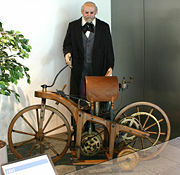 The first petroleum-powered vehicle, it was essentially a motorized bicycle, although the inventors called their invention the Reitwagen ("riding car"). However, if one counts two wheels with steam propulsion as being a motorcycle, then the first one may have been American. One such machine was demonstrated at fairs and circuses in the eastern U.S. in 1867, built by Sylvester Howard Roper of Roxbury, Massachusetts. In 1894, Hildebrand & Wolfmüller became the first motorcycle available for purchase. In the early period of motorcycle history, many producers of bicycles adapted their designs to accommodate the new internal combustion engine. As the engines became more powerful, and designs outgrew the bicycle origins, the number of motorcycle producers increased. Until the First World War, the largest motorcycle manufacturer in the world was Indian, producing over 20,000 bikes per year. By 1920, this honor went to Harley-Davidson, with their motorcycles being sold by dealers in 67 countries, until 1928, when DKW took over as the largest manufacturer. After the Second World War, the BSA Group became the largest producer of motorcycles in the world, producing up to 75,000 bikes a year in the 1950s. The German company NSU Motorenwerke AG held the position of largest manufacturer from 1955 until the 1970s. Today, the Japanese manufacturers, Honda, Kawasaki, Suzuki, and Yamaha dominate the motorcycle industry, although Harley-Davidson still maintains a high degree of popularity in the United States. Recent years have also seen a resurgence in the popularity of several other brands sold in the U.S. market, including BMW, Triumph, and Ducati. In November 2006, the Dutch company E.V.A. Products BV Holland announced that the first commercially available diesel-powered motorcycle, its Track T-800CDI, achieved production status. The Track T-800CDI uses a 800 cubic centimeter (cc) three-cylinder Daimler Chrysler diesel engine. However, other manufacturers, including Royal Enfield, had been producing diesel-powered bikes since at least 1965. 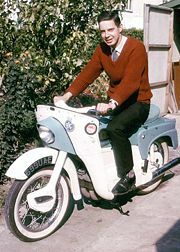 A 1966 British motorbike—the 250 cc Ariel Leader used a pressed-steel frame. The construction of modern motorcycles has been standardized mainly on the following key components. The chassis (or frame) of a motorcycle is typically made from welded aluminium or steel (or alloy) struts, with the rear suspension being an integral component in the design. Carbon-fiber and titanium are used in a few very expensive custom frames. Oil-in-Frame (OIF) chassis, where the lubricating oil is stored in the frame of the motorcycle, was used for Vincent motorcycles of the fifties, and for a while during the 1970s, on some NVT British motorcycles. It was widely unpopular and generally regarded as a bad idea at the time. Today, it is a widely used idea on "thumpers" (single-cylinder four-strokes) that usually have a dry-sump lubrication requiring an external oil tank. It has since gained some cache in modern (2006) custom bike world too because of the space saving it can afford and the reference to an earlier era. Buell motorcycles employ a similar design—the oil is held in the swingarm, while the fuel is held in the frame. Almost all commercially available motorcycles are driven by conventional gasoline internal combustion engines, but some small scooter-type models use an electric motor, and a very small number of diesel models exist (for example, the USMC M1030 M1 version of the Kawasaki KLR650 and the Dutch-produced Track T-800CDI). Opposed twin engine on a Ural. The displacement is defined as the total volume of air/fuel mixture an engine can draw in during one complete engine cycle. In a piston engine, this is the volume that is swept as the pistons are moved from top dead center to bottom dead center. To the layperson this is the "size" of the engine. Motorcycle engines range from less than 50 cc (cubic centimeters), commonly found in many small scooters, to 5735 cc, a Chevrolet V8 engine, currently used by Boss Hoss in its cruiser style motorcycle. Motorcycles have mostly, but not exclusively, been produced with one to four cylinders, and designers have tried virtually every imaginable layout. The most common engine configurations today are the vertical single and twin, the V-twin, the opposed twin (or boxer), and the in-line triple and in-line four. A number of others designs have reached mass production, including the V-4, the flat 6-cylinder, the flat 4-cylinder, the in-line 6-cylinder, and the Wankel engine. Exotic engines, such as a radial piston engine, sometimes appear in custom built motorcycles. Engines with more cylinders provide more power for the same displacement, and feel smoother to ride. Engines with fewer cylinders are cheaper, lighter, and easier to maintain. Liquid-cooled motorcycles have a radiator (exactly like the radiator on a car) which is the primary way their heat is dispersed. Coolant or oil is constantly circulated between this radiator and the cylinder when the engine is running. Air-cooled motorcycles rely on air blowing past fins on the engine case to disperse heat. Liquid cooled motorcycles have the potential for greater power at a given displacement, tighter tolerances, and longer operating life, whereas air cooled motorcycles are potentially cheaper to purchase, less mechanically complex, and lighter weight. An air cooled engine contracts and expands with its wider temperature range, requiring looser tolerances, and giving shorter engine life. The temperature range of an air cooled two stroke is even more extreme, and component life even shorter, than in an air cooled four stroke. Modern motorcycles normally have five or six forward gears. Only the largest touring motorcycles and a few models that are routinely used with a sidecar or converted to tricycle configuration are fitted with a reverse gear. On a few, including the Honda Gold Wing and BMW K1200LT, it is not really a reverse gear, but a feature of the starter motor which when reversed, performs the same function. The weight of these motorcycles, in excess of 360 kg (800 lbs), means that they cannot effectively be pushed backwards in some situations by a seated rider. Older motorcycles had various kinds of shifting arrangements. A common version before World War II was a hand operated shift lever that rose from the transmission behind the engine up to beside the fuel tank on its left or right side. Later, some motorcycles, especially British, used foot shift levers that were located on the right side of the transmission. Today, shifting on the world's motorcycles has been standardized to the left-side foot-operated shift lever. The clutch is typically an arrangement of plates stacked in alternating fashion, one geared on the inside to the engine and the next geared on the outside to the transmission input shaft. Whether wet (rotating in engine oil) or dry, the plates are squeezed together by a spring, causing friction build up between the plates until they rotate as a single unit, driving the transmission directly. A lever on the handlebar exploits mechanical advantage through a cable or hydraulic arrangement to release the clutch spring, allowing the engine to freewheel with respect to the transmission. A typical 5-gear, foot-shift transmission on an HD Sportster. The most commonly used transmission is a sequential gearbox. From neutral, either first or second gear can be selected, but higher gears may only be accessed in order—it is not possible to shift from second gear to fourth gear without shifting through third gear. A five-speed of this configuration is commonly said to be "one down, four up," and a six-speed is said to be "one down, five up" due to the placement of the gears with relation to neutral. Neutral is considered to be "half a click" from first and second gears, so shifting directly between the two gears is made in one firm movement. Neutral is not placed "below" first gear to prevent the rider accidentally selecting neutral while attempting to downshift to first gear, possibly leading to an accident. Scooters normally have a continuously variable transmission (CVT). The CVT is a type of automatic transmission (also occasionally used in cars) that can change the "gear ratio" (gears are not generally involved) to any one of the possible undetermined settings within a given range. The CVT is not constrained to a small number of gear ratios, such as the 4 to 6 forward ratios in typical automotive transmissions. CVTs are ideally suited to 2-wheeled vehicles because of the lack of shift shock. A conventional automatic transmission might shift shock at an unexpected moment and upset the vehicle. The CVT transmission also offers maximum power efficiency, an important factor for the engines with less than 100cc capacity typically used in scooters. Power transfer from the gearbox to the rear wheel is typically accomplished with a chain, which requires both lubrication and adjustment for elongation (stretch) that occurs through wear. The lubricant is subject to being thrown off the fast-moving chain and results in grime and dirt build up. Chains do deteriorate, and excessive wear on the front and rear sprockets can be dangerous. Many manufacturers offer cruiser models with final drive options of a belt or a shaft. A belt drive is still subject to stretch, but operates very quietly, cleanly, and efficiently. However, belt drives are limited in the amount of power they can transmit. A toothed belt is frequently used. 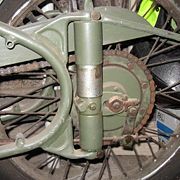 A shaft drive is usually completely enclosed; the visual cue is a tube extending from the rear of the transmission to a bell housing on the rear wheel. Inside the bell housing, a beveled gear on the shaft mates with another on the wheel mount. This arrangement is superior in terms of noise and cleanliness, and is virtually maintenance free. However, the additional gearsets are a source of power loss and add weight. The wheel rims are usually steel or aluminum (generally with steel spokes and an aluminum hub) or mag-type cast or machined aluminum. At one time, motorcycles all used spoke wheels built up from separate components, but, except for dirt bikes, one-piece wheels are more common now. Performance racing motorcycles often use carbon-fiber wheels, but the expense of these wheels is prohibitively high for general usage. Wire wheels, otherwise known as "laced wheels," have a central hub connected to the rim of the wheel via spokes made of wire. These spokes are generally quite solid and will not easily bend as would typical wire cord. Nevertheless, they mechanically function as wires under tension, holding the rim true and providing strength to the wheel. Cast magnesium disks, produced by one-step hot forging from magnesium alloys ZK60 and MA-14, are also used for many motorcycle wheels. Motorcycles mainly use pneumatic tires. However, in some cases where punctures are common (some enduros), the tires are filled with a "mousse," which is impossible to puncture. Both types of tire come in many configurations. The most important characteristic of any tire is the contact patch. That is the small area that is in contact with the road surface while riding. There are tires designed for dirt bikes, touring, sport, and cruiser bikes. Dirt bike tires have knobbly, deep treads for maximum grip on loose dirt, mud, or gravel; such tires tend to be less stable on paved surfaces. Touring tires are usually made of harder rubber for greater durability. They may last longer, but they tend to provide less outright grip than sports tires at optimal operating temperatures. The payoff is that touring tires typically offer more grip at lower temperatures, meaning they can be more suitable for riding in cold or winter conditions whereas a sport tire may never reach the optimal operating temperature. Sport/performance tires provide amazing grip but may last 1,000 miles (1,600 kilometers) or less. Cruiser and "sport touring" tires try to find the best compromise between grip and durability. There is also a type of tire developed specifically for racing. These tires offer the highest of levels of grip for cornering. Due to the high temperatures at which these tires typically operate, use on the street is unsafe because the tires will typically not reach optimum temperature before a rider arrives, thus providing almost no grip en route. In racing situations, racing tires would normally be brought up to temperature in advance by the use of tire warmers. Front brakes are generally much more effective than rear brakes: Roughly two thirds of stopping power comes from the front brake—mainly as a result of weight transfer being much more pronounced compared to longer or lower vehicles, due to the motorcycle's relatively short wheelbase. Brakes can either be drum or disc based, with disc brakes being more common on large, modern or more expensive motorcycles for their far superior stopping power, particularly in wet conditions. There are many brake-performance-enhancing after market parts available for most motorcycles, including brake pads of varying compounds and steel-braided brake lines. Modern designs have the two wheels of a motorcycle connected to the chassis by a suspension arrangement, however "chopper" style motorcycles often elect to forgo rear suspension, using a rigid frame. With dirtbikes excluded, almost all motorcycles have a speedometer, an odometer, and a tachometer. Fuel gauges are becoming more common, but traditionally a reserve tank arrangement is used with a petcock (petrol tap) on the side of the motorcycle allowing the rider to switch to a reserve fuel supply when the main fuel supply is exhausted. There is not actually a separate reserve tank: The intake for the petcock has two pipes, one extending higher into the fuel tank than the other. When fuel no longer covers the longer pipe the engine will lose power/splutter and the rider switches the petcock to the "reserve" setting, which accesses the shorter pipe. Riders whose bikes lack a fuel gauge (most machines prior to the past few years) usually learn how many miles/kilometers they can go with a full tank of fuel, and then use a trip meter if available to judge when they must refill the tank. Motorcycle fuel economy benefits from the relatively small mass of the vehicle, compared to its passengers and to other motor vehicles, and subsequent small engine displacement. However, poor aerodynamics of exposed passengers and engines designed for goals other than fuel economy can work to reduce these benefits. Fuel economy varies greatly with engine displacement from a low of 29 mpg U.S. (8.1 L/100km) reported by a Honda VTR1000F rider to 107 mpg U.S. (2.2 L/100km) reported for the Verucci Nitro 50cc Scooter. A specially designed Matzu Matsuzawa Honda XL125 achieved 470 mpg U.S. (0.5 L/100km) "on real highways—in real conditions." Motorcycles must be leaned in order to turn. This lean can be induced by a method known as countersteering, in which the rider turns the handlebars in the direction opposite of the desired direction of turn. In other words, press forward on the handgrip in the desired direction—press right to go right, press left to go left. This concept is counter-intuitive and often very confusing to novices—and even to many experienced motorcyclists. The primary effect of countersteering is to shift the front tyre contact patch such that a lean is initiated. Other methods allegedly used for turning a motorcycle, such as shifting weight to the side or the pegs, only help leaning the body of the motorcycle towards a direction; thus turning the front wheel in the opposite direction due to the preservation of angular momentum, and eventually resulting in countersteering. 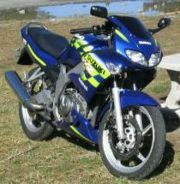 Short wheelbase motorcycles, such as sport bikes, can generate enough torque at the rear wheel and enough stopping force at the front wheel in order to flip longitudinally. These actions, especially if performed on purpose, are known as wheelies and stoppies respectively. A motorcycle is generally provided with various standard or optional attachments. Consider the following examples. A plastic or fibreglass shell, known as a "fairing," is placed over the frame on some models to shield the rider from the wind, aid in aerodynamics and protect engine components in an accident and also from theft. Drag is the major factor that limits motorcycle speed, as it increases at the square of the velocity, with the resultant required power increasing with the cube of velocity. As can be seen from the streamlined appearance of new performance motorcycles, there is much aerodynamic technology included in the design. Unfortunately, since the 1958 FIM ban on "dustbin" fairings no major manufacturer has been bold enough to overcome the effect of the turbulence caused by the spinning front wheel, which prevents the motorcycle from cutting a clean path through the air. The "dustbin" fairing can improve aerodynamic performance without unacceptably compromising the rider's ability to control the machine, although with a weight penalty. In the absence of a fairing or windshield, a phenomenon known as the windsock effect occurs at speeds above 100 km/h, where the rider becomes a major source of drag and is pushed back from the handlebars, tiring the rider. However, these motorcycles still effectively push their way through the atmosphere with brute force. A cabin cycle, which has a hull that wraps around the basic cycle frame, solved the problem of aerodynamics by isolating driver from outside air. Modern fairings on touring and sport-touring motorcycles dramatically improve a rider's comfort and attention on long rides by reducing the effect of the wind and rain on the body. They also help keep a rider warm in cold weather, reducing hypothermia. Heated hand grips, and even heated seats, also improve rider comfort in cold weather. Motorcycles from a number of manufacturers now have electric windshields, which raise and lower the windshield with the push of a button to the optimum height for conditions. As motorcycles lack climate control or proper protection from the wind, some manufacturers offer heated seats or hand grips to relieve the discomfort of wind chill during night riding or the colder months. They can also be added on as after market accessories and are powered by the bike's battery. A common addition to many bikes is an attachment onto which bags or other luggage can be fastened. This removes the need for rider backpacks and is generally a more secure and safe way to add carrying capacity to a motorcycle. A sidecar is a one-wheeled device attached to the side of a motorcycle, producing a three-wheeled vehicle. Early sidecars were intended to be removable devices that could be detached from the motorcycle. Sidecars gradually superseded forecars and trailers. The forecar comprised a two-wheeled attachment attached to the front of the motorcycle; the trailer was just that, leaving the passenger to be hauled along behind the vehicle. In neither case could rider and passenger converse easily—this may be why early sidecars were often called "sociable" attachments. A trailer hitch or tow hitch is a device mounted on a motorcycle that enables it to tow a motorcycle trailer, usually in order to haul additional gear. A motorcycle trunk is a storage compartment in the vicinity of the seat, other than panniers or saddlebags. A trunk mounted above and to the rear of the seat is also called a top box. Social motorcyclist organizations are popular and are sometimes organized geographically, focus on individual makes, or even specific models. Example motorcycle clubs include: American Motorcyclist Association, Harley Owners Group, Gold Wing Road Riders (GWRRA), and BMW MOA. Many motorcycle organizations raise money for charities through organized events and rides. Some organizations hold large international rallies in different parts of the world that are attended by many thousands of riders. While the reasons for people choosing to ride motorcycles are many and varied, those reasons are increasingly practical, with riders opting for a powered two-wheeler as a cost-efficient alternative to infrequent and expensive public transport systems, or as a means of avoiding or reducing the effects of urban congestion. In places where it is permitted, lane splitting, also known as filtering, allows motorcycles to use the space between vehicles to continue moving through stationary or slow traffic. In England, motorcycles are exempt from the "London congestion charge" other vehicles have to pay to enter the city during the day. Motorcycles are also exempt from toll bridge charges at some crossings, such as the Severn Bridge and Dartford Crossing. In many countries, solo motorcycles are allowed to use high-occupancy vehicle lanes and some cities, such as Bristol, allow motorcycles to use bus lanes and provide dedicated free parking. In many cultures, motorcycles are the primary means of motorized transport. According to the Taiwanese government, for example, "the number of automobiles per ten thousands population is around 2,500, and the number of motorcycles is about 5,000." Motorcycles have a far higher rate of crippling and fatal accidents per unit distance than automobiles. According to the U.S. Highway Safety Authority, in 2004 15.0 cars out of 100,000 ended up in fatal crashes while the rate for motorcycles is 69.3 per 100,000. The picture is grimmer when distance traveled are taken into account: In 2004 in the U.S., there was 0.4 fatalities per million miles compared to 0.012 passenger car fatalities per million miles (a ratio of 33 to 1). A common emergency room term for motorcycle is "donor cycle," which refers to fatal crashes where the motorcyclist's organs are donated for use in transplants. The two major causes of motorcycle accidents in the United States are: (1) Motorists pulling out or turning in front of motorcyclists and violating their rights-of-way and (2) motorcyclists running wide in turns and crashing, are made more likely when motorcyclists mix drinking with riding. Motorcyclists can do much to anticipate and avoid these crashes by getting proper training, increasing their visibility to other traffic, and separating alcohol and riding. The United Kingdom has a number of organizations which are dedicated to improving motorcycle safety by providing advanced rider training over and above what is necessary to pass the basic motorcycle test. These include the Institute of Advanced Motorists (IAM) and the Royal Society for the Prevention of Accidents (RoSPA). Along with increased personal safety, riders with these advanced qualifications often benefit from reduced insurance costs. Motorcycle Safety Education is offered throughout the United States by a number of organizations ranging from state agencies to non-profit organizations to corporations. The courses, designed by the Motorcycle Safety Foundation (MSF), include a Basic Rider Course, an Intermediate Rider Course and an Advanced Rider Course. In some Australian jurisdictions, such as New South Wales, the Australian Capital Territory and the Northern Territory, it is compulsory to undertake a rider training course before being issued a Learners License. There are two major types of motorcycle, street and off-road. Within these types, there are many different types of motorcycles for many different purposes. Choppers: Highly customized motorcycles based on a cruiser-style frame with long rake (longer front forks) and wild paint jobs. These are created more for show than dependability and ease of ride. An Italian 125cc Cagiva Planet. Cruisers: A range of small to large motorcycles designed for comfort and looks with a relaxed upright seating position. They are notable for their heavy use of chrome and are often highly customized. Electric motorcycles: Nearly silent, zero-emission electric motor-driven vehicles. Though electric motorcycles are emission free during operation, producing the electricity that charges the batteries in them can be a cause of pollution. Operating range and top speed suffer because of limitations of battery technology. Mini bikes: Very small bikes designed to be simple and fun for children. Generally they have no clutch or shifting to simplify operation. Also known as Mini Motos. Not street-legal in most countries and jurisdictions. May be used for racing by all age levels. Mopeds: Small, light, inexpensive, efficient rides for getting around town. Usually started by pedaling (motorcycle + pedals = moped). Scooters: Motorbikes with a step-through frame and generally smaller wheels than those of a traditional motorcycle. Can be ridden without straddling any part of the bike. Available in sport, commuter, and touring models. Sport bikes: Fast, light, sleek motorcycles designed for maximum performance, for racing or spirited road riding. They are distinguishable by their full fairings and the rider's tipped-forward seating position. They are also called "race replicas" because of their connection to the racing category for production motorcycles known as Superbike racing. The power to weight ratio of the 900cc+ models typically matches or exceeds one bhp of power for every one Kg of mass. Naked bikes/Standard/Street bikes: Naked bikes have a riding position midway between the forward position of a sports bike and the reclined position of a cruiser. Unlike touring bikes, naked bikes often have little or no fairing (hence the title). Luggage capabilities are often an optional extra. Naked bikes are popular for commuting and other city riding as the upright riding position gives greater visibility in heavy traffic (both for the rider and to other road users) and are more comfortable than the hunched over sport bikes. Racing bikes: Motorcycles designed for circuit or road racing, including mass-production motorcycles modified for motorcycle racing or sport riding. Street customs: Highly customized motorcycles with wild paint jobs also built for show, but constructed from a sport bike frame instead of a cruiser-style frame. Touring motorcycles: Touring bikes are designed for rider and passenger comfort, luggage carrying capacity, and reliability. Cruisers, sport bikes and some dual-sports can also be used as touring bikes with the addition of after market luggage and seats. Sport touring motorcycles: Sport-tourers are factory-built hybrids of a sport bike and a touring motorcycle, for those who desire the qualities of both. Motocross bikes: Motorcycles designed for racing over closed circuits, often with jumps, over varied terrain of gravel/mud/sand. Supermotos: Beginning in the mid-1990s, motocross machines fitted with street wheels and tires similar to those used on Sport bikes began to appear. These are known as "Supermotards," and riders of these machines compete in specially organized rallies and races. Trials motorcycles: Motorcycles made as light as possible, with no seat, in order to provide maximum freedom of body positioning for use in observed trials competition. Dual-sports: Road-legal machines offering a compromise in highway and off-road performance, durability, and comfort. Since the requirements are often conflicting, the manufacturer has to choose one or the other, resulting in a great variety of bikes in this category. Enduros: Road-legal versions of a motocross machine, that is, featuring high ground clearance and copious suspension with minimal creature comforts. Highly unsuitable for long distance road travel. The features that differ from the motocross versions are the silencers, the flywheel weights and the presence of features necessary for highway use. A motorcycle is broadly defined by law in some countries for the purposes of registration, taxation or licensing riders as a two-wheel motor vehicle "fit to drive." Other countries distinguish between mopeds and other small bikes and the larger, more powerful vehicles. In the UK, the rules on which motorcycle may be ridden by whom are complex. A "moped," which can be ridden at age 16, has a maximum design speed not exceeding 50 km/h (30 mph) and engine capacity no greater than 50 cc. A "learner motorcycle," which can be ridden from age 17, has an engine up to 125 cc with a power output not exceeding 11 kilowattws (kW). A scooter and a motorcycle. A "large motorcycle," which can only be ridden by a person age 21 or older with two years experience on a learner motorcycle, has a power output of at least 35 kW. Otherwise, riders are restricted to riding motorcycles with a power output of not more than 25 kW for two years after passing their initial motorcycle test. For riders in the UK over age 21, there is a direct access route to gaining a license to ride a large motorcycle. This allows somebody with no motorcycle experience to train and pass a test in around five days. Nevertheless, all motorcycle riders in the UK must first take a one-day compulsory basic training (CBT) course, regardless of which class of motorcycle they intend to ride. In New Zealand, "learner" and "restricted" motorcycles need only have a 250 cc engine capacity. This distinction draws some criticism, as it allows 15 year old learner riders to operate bikes capable of reaching speeds in excess of 250 km/h. The laws of some countries allow anyone with a car license to legally ride mopeds not exceeding 50 cc in capacity, meaning that they do not need to show any competency in handling such a vehicle. The laws and regulations for legal moped usage in the U.S. vary by state. The specifics of the motorcycle and moped laws in the U.S. can be obtain from each individual state's Department of Motor Vehicles Websites. ↑ Total Motorcycle, The Past—1800s: First motorcycle, The History and Future of Motorcycles and motorcycling—From 1885 to the Future. Retrieved March 31, 2007. ↑ Cyber Motorcycle, Brief History of the Marque: Hildebrand & Wolfmuller, Hildebrand & Wolfmuller Motorad, European Motorcycle Universe. Retrieved March 31, 2007. ↑ Motorcycle Museum, The History of Motocross, Part Two: Motocross goes International, 1947 through 1965. Retrieved March 31, 2007. ↑ "The first commercially-available diesel motorcycle," Gizmag.com (November 20, 2006). Retrieved March 31, 2007. ↑ See, e.g.,"Diesel motorbikes," Journey to Forever. Retrieved March 31, 2007. ↑ Total Motorcycle, Fuel Economy Guide. Retrieved August 14, 2006. ↑ www.gekgo.com, VERUCCI GAS SCOOTERS. Retrieved August 15, 2006. ↑ Craig Vetter Fuel Economy Contest, 1980-1985. Retrieved August 15, 2006. ↑ Federation of European Motorcyclists, Rider training in Europe The Views and the Needs of the Rider. Retrieved March 31, 2007. ↑ Why Bike? All the info you need on lanesharing (lanesplitting). Retrieved March 6, 2006. ↑ www.gio.gov.tw, Sustainable Development Indicators for Taiwan. Retrieved August 14, 2006. ↑ www.clarity.net, The Hurt Report: Motorcycle Accident Cause Factors and Identification of Countermeasures. Retrieved March 31, 2007. ↑ www.ipe.nt.gov.au, ACT Learner Motorcycle License. Retrieved March 31, 2007. ↑ UK Department of Transport, Mopeds and Motorcycles: Routes to your license. Retrieved March 3, 2007. Hough, David L. 2000. Proficient Motorcycling: The Ultimate Guide to Riding Well. Irvine, CA: BowTie Press. ISBN 1889540536. Motorcycle Safety Foundation. 2005. The Motorcycle Safety Foundation's Guide to Motorcycling Excellence: Skills, Knowledge, and Strategies for Riding Right. Center Conway, NH: Whitehorse Press. ISBN 1884313477. Walker, Mick. 2006. Motorcycle: Evolution, Design, Passion. Baltimore: The Johns Hopkins University Press. ISBN 0801885302. American Motorcyclist Association—the governing body for motorcycle sport in the U.S.
Motorcycle Safety Foundation—an internationally recognized developer of comprehensive, research-based, motorcycle rider education and training. This page was last modified on 25 October 2018, at 15:25.